Forty years ago today, the four founding members of KISS — Gene Simmons, Paul Stanley, Ace Frehley and Peter Criss — released their respective solo albums all on the same day to much fanfare, chart success, and platinum sales. And now, four decades later, all four of these pioneering albums are celebrated in “The Solo Albums – 40th Anniversary Collection”, a limited-edition 180-gram 4LP box set by Casablanca/UMe that’s earmarked for release on October 19. Preorders commence today, September 18, for the limited run of 2,500 vinyl box sets, available exclusively through KISS‘s artist webstore and The Sound Of Vinyl. 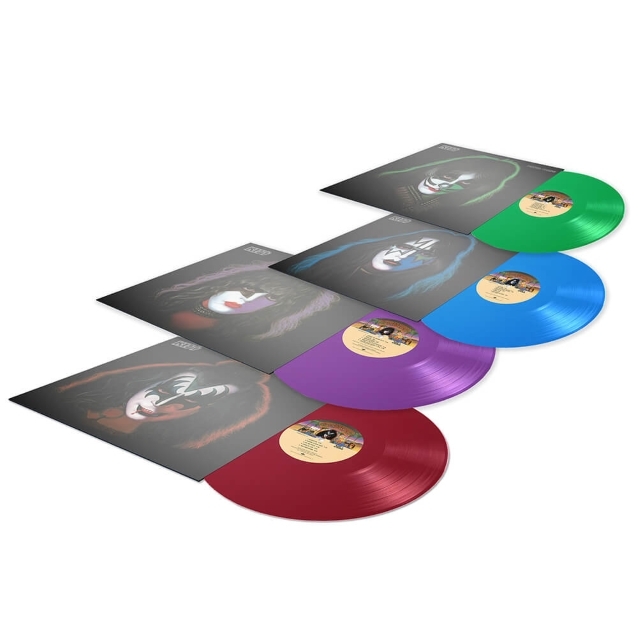 Each heavyweight 180-gram LP features a unique color to match its associated cover art; “Gene Simmons” appears in red vinyl, “Paul Stanley” sports purple vinyl, “Ace Frehley” contains blue vinyl, and “Peter Criss” is in green vinyl. All four albums are housed together in a deluxe black-matte slipcase that features glossy black images of the four artists’ faces surrounding a silver-foil print of the infamous KISS logo. Also included in this set are four 12-by-12-inch posters of each album cover, plus an exclusive turntable slipmat that shows all four of artist Eraldo Carugati‘s iconic, painted album-cover face images all connected together. All four of these solo albums served to showcase the wide range of talents of each KISSbandmember. “Gene Simmons”, co-produced by Simmons and Sean Delaney, features the band’s bassist and co-lead vocalist switching over mainly to acoustic and electric guitar duties for songs that highlight his penchant for BEATLES-esque melodies, funk, and hard rock. Highlights include a remake of “See You In Your Dreams” (initially found on KISS‘s 1976 benchmark album “Rock And Roll Over”) and a cover of the 1940 Disney classic from “Pinocchio”, “When You Wish Upon A Star”. Guest musicians include AEROSMITH‘s Joe Perry, CHEAP TRICK‘s Rick Nielsen, Bob Seger, Cher, Donna Summer and Katey Sagal. Meanwhile, “Paul Stanley” was co-produced by Stanley and Jeff Glixman and it showcases all-original material and stellar work across the board from the KISS lead vocalist and rhythm guitarist, in addition to lead and acoustic guitar work from longtime KISS axe associate Bob Kulick. The super-catchy track “Hold Me, Touch Me (Think Of Me When We’re Apart)”reached No. 46 on the Billboard Hot 100 Singles chart. “Ace Frehley”, produced by Eddie Kramer and Frehley, finds the lead guitarist doing what he does best. Frehley‘s foot-stomping cover of “New York Groove”, originally a 1975 hit by the British glam band HELLO, peaked at No. 13 on the Billboard Hot 100 Singles chart. Guest musicians include Anton Fig on drums (a sometimes KISS session musician who later became a member of FREHLEY’S COMET) and bassist Will Lee, both of whom went on to become core members of both of David Letterman‘s late-night talk-show house bands led by keyboardist Paul Shaffer. Finally, “Peter Criss” was produced by Vini Poncia, a onetime Ringo Starr co-writer who later produced a pair of key KISS albums, 1979’s “Dynasty” and 1980’s “Unmasked”. Most of the songs on “Peter Criss” had been written back in 1971 for the drummer/vocalist’s aptly named pre-KISS band, LIPS. The album also boasts a rousing cover of Bobby Lewis‘s No. 1 1961 hit single, “Tossin’ And Turnin'”, a song that KISS often wound up playing live during their 1979 “Dynasty” tour.